A film made by Paul Cooke from the University of Leeds has been shortlisted for two of the Arts and Humanities Research Council’s prestigious 2018 Research in Film Awards. The film, called The Born Free Generation, Phendulani's Story and Me, has made the shortlist for the Best Research Film of the Year, and the film’s trailer has been short-listed for the Social Media Short Award. Nearly 150 films were submitted for the Awards this year and the overall winner for each category, who will receive £2,000 towards their filmmaking, will be announced at a special ceremony at 195 Piccadilly in London, home of BAFTA, on 8 November. 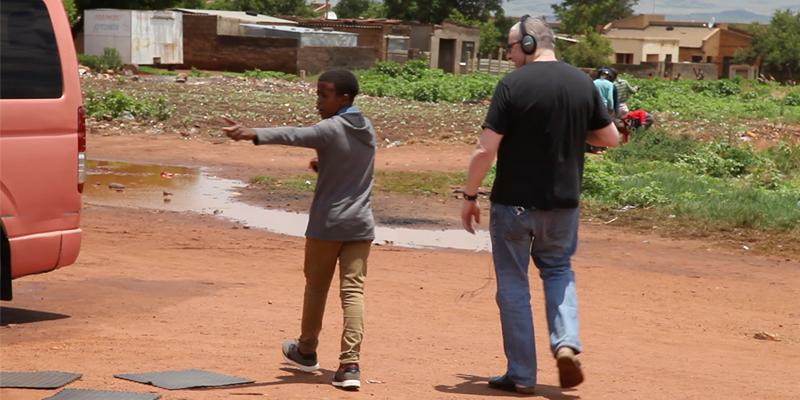 The Born Free Generation, Phendulani's Story and Me tells the story of Phendulani, a 15-year old young man who was living on the streets of Vosloorus Township until he made contact with Lethi’Thema Safe Park (Youth Centre), which is supported by the UK-based charity The Bishop Simeon Trust. It tackles questions such as: What’s it like to be growing up in South Africa over twenty years after the end of apartheid? What does democracy mean to this generation? What are their hopes for the future? Filmmaker and Professor of World Cinemas Paul Cooke, said: “I can’t believe that we’ve been short-listed for two awards. Working with Bishop Simeon Trust and the vulnerable young people they support in South African Townships has been life changing for me. Mike Collins, Head of Communications at the Arts and Humanities Research Council, said: "The standard of filmmaking in this year's Research in Film Awards has been exceptionally high and the range of themes covered span the whole breadth of arts and humanities subjects. "While watching the films I was so impressed by the careful attention to detail and rich storytelling that the filmmakers had used to engage their audiences. The quality of the shortlisted films further demonstrates the fantastic potential of using film as a way to communicate and engage people with academic research. Above all, the shortlist showcases the art of filmmaking as a way of helping us to understand the world that we live in today." A team of judges watched the longlisted films in each of the categories to select the shortlist and ultimately the winner. Key criteria included looking at how the filmmakers came up with creative ways of telling stories – either factual or fictional – on camera that capture the importance of arts and humanities research to all of our lives. Judges for the 2018 Research in Film Awards include Joanna Norman, Director of the V&A Research Institute, Steve Harding-Hill, Creative Director in Commercials and Short Form at Aardman Animation and Dorothy Byrne, Head of News & Current Affairs, Channel 4 News. The winning films will be shared on the Arts and Humanities Research Council website and YouTube channel. On 8 November you’ll be able to follow the fortunes of the shortlisted films on Twitter via the hashtag #RIFA2018.